Another November is about to wrap-up, and between our annual gala and Giving Tuesday, it certainly was a month that gave us plenty to be thankful for! Tis the season! But before we start getting the wrapping paper down from the closet just yet, let’s take a look at everything that kept the Joe Andruzzi Foundation busy in November! 2018 JAF Gala a Huge Success! Everyone who joined us at Gillette Stadium on Thursday, November 15th certainly came ready to help us “play it forward” despite the winter wonderland that was accumulating on the ground outside. By the end of the night we had raised an incredible $1.2 million – meaning the gala has raised more than $7 million over its 11-year history! It was truly a team effort thanks to our donors, supporters, and volunteers. Our thanks go out to the event’s sponsors, led by Presenting Sponsor J.Derenzo Companies. We also want to thank our Diamond Sponsors, Bob’s Discount Furniture, East Commerce Solutions, and Suffolk Construction; our Platinum Sponsors, CVS Health, MedScience Ventures, The Kraft Group, Stop & Shop, and Zudy; our Gold Sponsors, ALEX AND ANI, Pharmacyclics and Janssen, Rodman Ford, and the Remondi Family, along with many other generous sponsors. Looking for photos from the Gala? Check out our Facebook event photo album here, our guest photo album here – and be sure to read our event recap blog, here. Because of our amazing supporters and Bob’s Discount Furniture’s generous match, the Joe Andruzzi Foundation raised $75,000 for New England cancer patients through our #GivingTuesday campaign! For this year’s annual day of giving, we once again pulled together JAF’s staff, volunteers, patient recipients, and a few special guests to film “Thank You Selfies” that we sent out across our social media channels – all to let our generous donors know how much their contributions mean to our Foundation. Can you believe November has already come and gone? 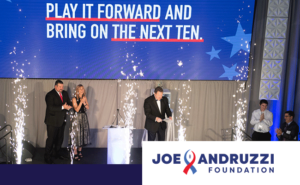 The good news is there are still a few days left to make a donation to JAF before the tax year comes to a close – but time is running out! It’s easy! Visit the “Ways to Give” page (here) on the JAF website to browse the various ways you can support JAF – or, you can keep it simple and visit our donation page (here). Individual Retirement Account (IRA): Are you 70.5 or older with an IRA? You can transfer a donation directly to JAF without incurring taxes. Donor Advised Funds: Give through your donor advised fund to maximize your impact to JAF patients and their families in need of financial assistance. Your fund sponsor handles all record-keeping, disbursements, and tax receipts. Stock or Securities: Did you know you can also make a gift of stock or securities to support JAF without any capital gains tax? 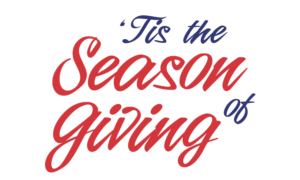 Questions about any of the ways you can make a year-end tax-efficient gift to JAF? Contact Erin Chatham at Erin@joeandruzzifoundation.org. Have you been thinking about hosting your own event, fundraiser, or athletic campaign to benefit the Joe Andruzzi Foundation? This holiday season is the perfect time to get started! First, be sure to review JAF’s brand-new Supporter Hosted Fundraising Toolkit to discover fundraising campaign ideas, tips, and resources available to help you reach your goals. Next, feel free to reach out to our event staff (here) with any questions you still may have before applying. For complete info on how you can get your fundraising idea off the ground, click this link. Cancer patients who apply for financial assistance from JAF work closely with their social worker or patient navigator at their healthcare facility. 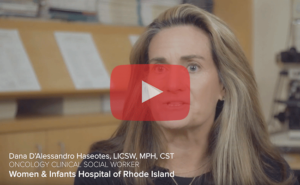 These social workers are key members of a patient’s advocacy team and they work in close partnership with JAF to get them the financial assistance they need when they need it most. Thanks to our friends at ALEX AND ANI, we are able to capture and share an amazing video filmed by David Bettencourt featuring one of JAF’s healthcare partners – Dana D’Alessandro Haseotes – who shares how JAF is there as a critical resource for cancer patients.